Have you ever wanted to just freshen up your dog in-between baths? I know I have! I have been bathing Dexter with 4-Legger products since 2016 about every 2-3 weeks. I never need to worry about what’s inside his organic shampoo, because 4-Legger shampoo uses simple and organic ingredients. There is NOTHING artificial nor any synthetic chemicals. I can feel safe bathing Dexter as often as needed. However, he’s not a fan of his baths, and I do like to ensure he smells fresh all the time. This is especially true when I take him to an outside dog-friendly restaurant or dog-friendly store or attraction. I can’t give the poor boy a bath every day; I think he’d pack his bags and leave. The truth about most dog perfumes is that they have at least one, if not more, harmful chemicals. I looked up three dog and puppy perfumes, and all three had one or more of these ingredients: fragrance, phenoxyethanol, and isobutane. These are just three of many ingredients that can be harmful to both you and your pet. This is why it’s always critical to flip the bottle over and read and research each ingredient that. Remember, it’s not the front of the bottle that’s important, it’s the entire ingredient panel. As you can see by the two ingredient panels above, there are no artificial, synthetic, or harmful ingredients. They don’t use “fragrance” for their scent, they manufacture their dog cologne sprays with high-grade essential oils. As a matter of fact, Angela over at 4-Legger has been my go-to gal when I’m researching essential oils. She’s truly a guru when it comes to ingredient quality. I received 4-Legger’s dog deodorizing spray right before Dexter and I left for our dog-friendly trip to Delaware. I packed both sprays and boy, was I happy that I did. During our trip, Dexter was true to form and sniffed everything he could and got a little grimy during the day. 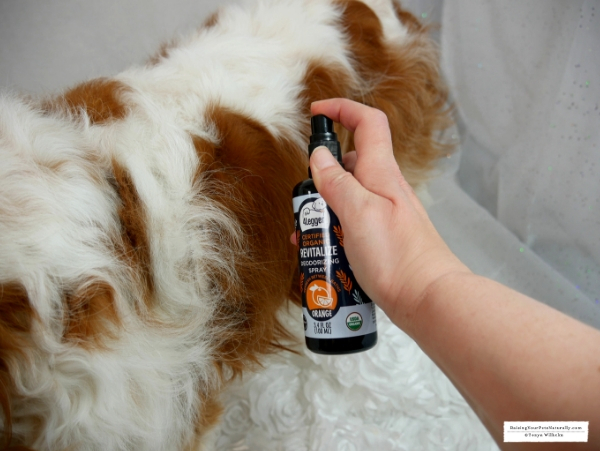 Prior to heading to a dog-friendly cafe, I brushed Dexter thoroughly and lightly applied the orange Revitalize spray on his feet, belly, and back. True to all 4-Legger products, I was very happy with the results. 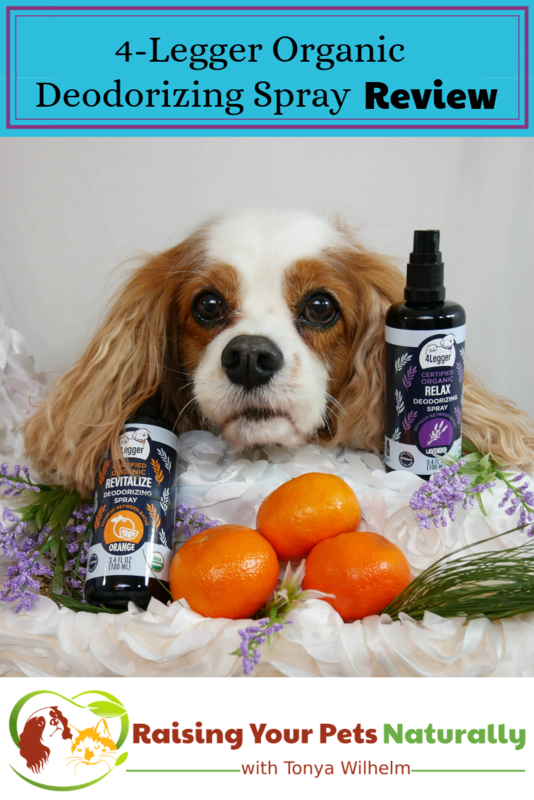 The sweet smell of orange was not overpowering but provided Dexter with a refreshing scent. The spray did not leave his coat oily or sticky. 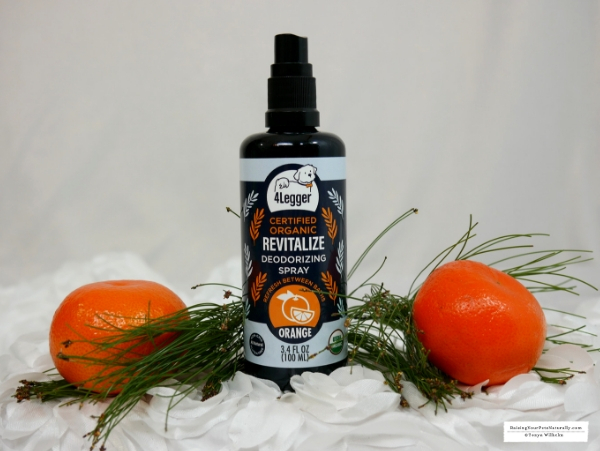 The oils in the Revitalize formula also benefit skin conditions. The next day, we had the same routine, except I tried the Relax formula. Again, the lavender spray was light and relaxing. Lavender is known to help calm the mind and encourage skin healing. 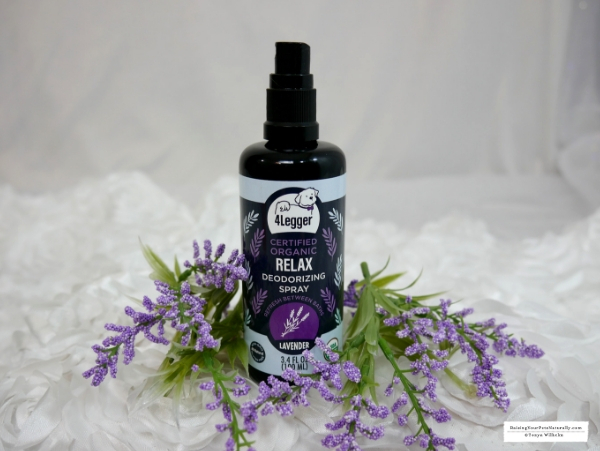 If you are a fan of essential oils the sprays can also add another layer of protection against pests or in the case of the lavender to help calm your dog before stressful situations. 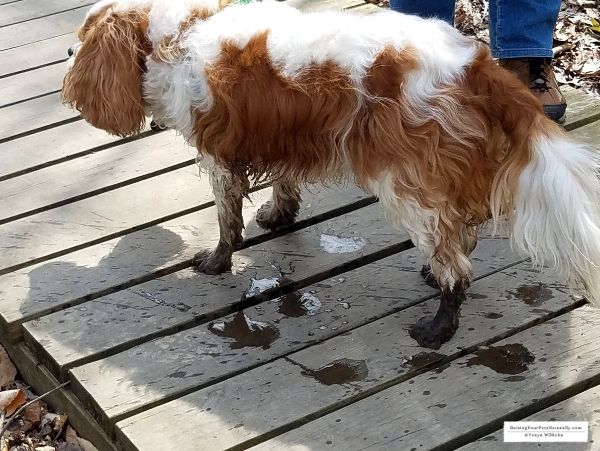 During our trip, Dexter really got into a mess and plopped himself ankle deep into mud! Although, the dog deodorizing spray is not a shampoo, I took it into the bath and spritzed his feet and scrubbed with warm water. It certainly helped get the muck and smell off. I will, however, be taking a travel-size bottle of 4-Legger shampoo with me on all of our upcoming road trips. 4-Legger products are always created with your pet’s best health in mind. Their line of dog deodorizing sprays are not different. From their highest-quality ingredients to their Miron glass bottles, they are a brand I fully trust with Dexter’s health and well-being. 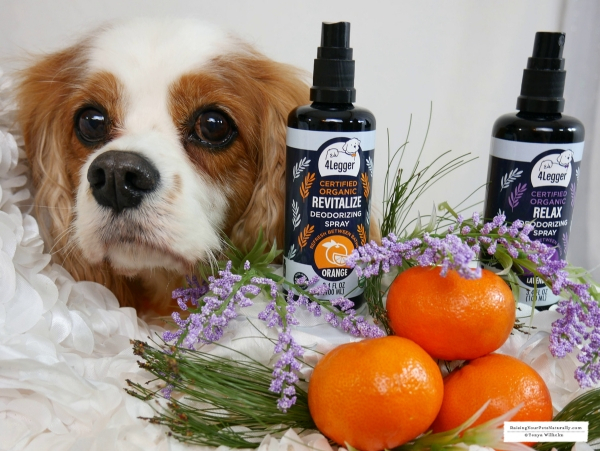 If you are looking for a top-notch organic dog grooming brand, you need look no further than 4-Legger. Tell them that Dexter sent you. Order today with promo code RaiseNaturally20 for 20% off your first order. Does your dog like his baths? Perfumes for dogs? I swear I didn’t believe it could exist, but if they don’t bother them it’s wonderful to make even our four-legged friends smell. lol Thankfully, this is more of a deodorizer to freshen them up. I am not currently a dog owner and haven’t been for a while. I wonder if hubby would have liked our last stinky dog better if we had this organic dog perfume. Oh, wet dog! lol You should definitely check it out. I’ve never heard of this brand, but your in-depth review made me interested. Seems like an affordable option for a quality product for my pets. And I love that it was organic.. So glad to share! 4-Legger is such an amazing company and I fully trust all their products. Thank you for sharing! 4-Legger products are amazing. I haven’t found any other dog grooming brand that even compares to 4-Legger’s safe ingredients. wow I havent heard of perfume for dogs! but if they like it, then great! My Dad’s dog is all for baths until he has to get soaped up….then the real struggle begins lol. 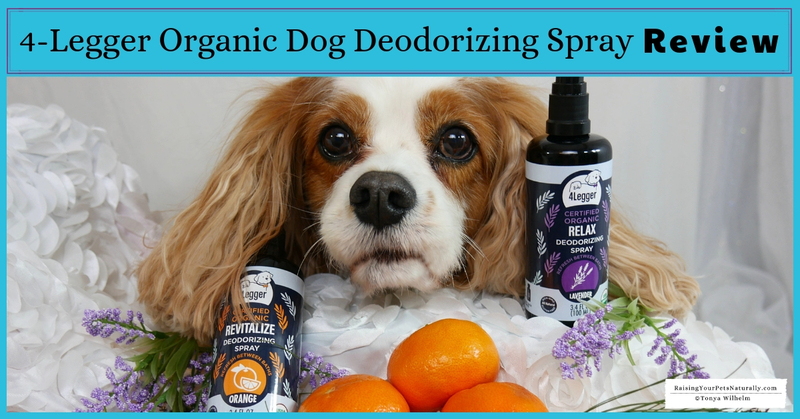 I love that there is an organic and healthy deodorizing sprays for dogs, that makes the keeping them clean-ish process alot easier to handle lol. haha Oh, man! Dexter isn’t a fan of baths, but he does tolerate them. Oh Dexter is adorable!! Sounds like a great product to try too! Thanks for sharing! Hi Catherine. Thank you. Yes, 4-Legger’s deodorizing spray is perfect for us. Then, you will love and appreciate 4-Legger. The best out there! Good to hear that they have organic products that won’t harm our dogs to help deodorize the smell. The citrus orange smell must be really nice. I wonder if this can be use for cats too. Cats are unlikely to like the peppermint and citrus is on the fence. But, the lavender would be great! It’s great for in-between baths. A nice way do deodorize and freshen up. Thanks for sharing this. Great idea for pups, Love it. I’m always looking for a way to have the air smell good! Yes. Definitely can be used as a safe air freshener! Oh this is a great idea and always good that its organic! I’m not a big fan of that “dog smell”. I think this would be a super great gift idea for a lot of friends with pets! You are right. This would be a great gift idea! I’m glad that my dog naturally doesn’t smell, but if he did this is definitely the kind of product I would choose! I love doggy perfume! I use it for my little Sammy when he gets his baths too!